at the end of the night, they disappear with no strings attached. They have never encountered a wedding they couldn't get themselves into. 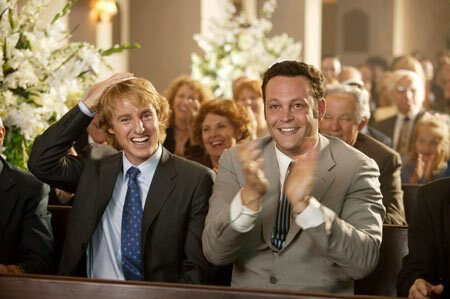 Guided by a secret set of wedding crashing "rules", the pair find their way into a different wedding and different bridesmaid's heart every week, but when one of them falls for the engaged daughter (Rachel McAdams) of an influential and eccentric politician (Christopher Walken) at the social event of the year, they get roped into spending a wild weekend at the family's palatial waterfront estate and quickly find themselves in over their heads - with hilarious consequences! Starring: Owen Wilson (Starsky & Hutch. Meet The Parent), Vince Vaughn (Dodgeball, Zoolander), Rachel McAdams (Mean Girls, The Notebook), Christopher Walken (Catch Me If You Can, Pulp Fiction), Isla Fisher (I Heart Huckabees, Scooby-Doo) and Jane Seymour. Directed by David Dobkin (Shanghai Knights). 2. Which actor playes the eccentric politician in the film?